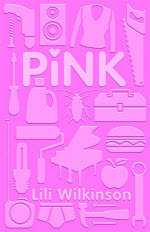 kt literary » Blog Archive » PINK on film! Not a movie deal — not yet, at least — but I thought you might enjoy hearing a little bit more about Pink by Lili Wilkinson in the author’s own words. It’s out now in Australia, and coming to our shores next year. Otherwise, I’m traveling today, and hoping to get some reading done. Anyone got something fun and exciting planned for the weekend? Enlightening the world, one helpful atcrile at a time.